The more time goes by, the cannier Toshiba seems to get at understanding the needs of specific sections of the UK TV market. The Toshiba 46TL868 tested recently did a great job of catering for people wanting a good-sized active 3D screen on the cheap. And now there's the Toshiba 32RL858, a 32-inch TV that manages to combine a strikingly affordable price point with just the sort of features and looks a savvy budget 32-inch TV buyer would be crying out for. It's remarkably slim for a budget television, for a start, with both a tiny bezel and a trim rear that will help it fit into a potentially much snugger space than your average 32-inch TV. It's also got a built-in Freeview HD tuner, and uses Edge LED lighting rather than an old-school CCFL system. It also rather excellently fits into modern lifestyles by supporting playback of multimedia files from either a networked (ideally Windows 7) PC or a USB storage device. 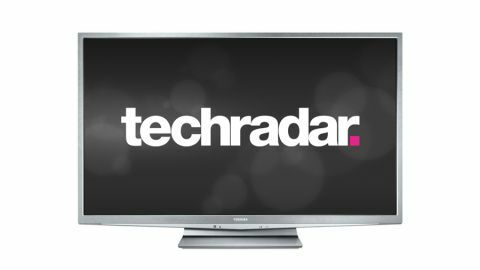 As if this wasn't already more than enough for a 32-inch TV costing under £400, the Toshiba 32RL858 even carries the brand's new online platform, Toshiba Places, which provides access to various video, music and information services. In fact, so strong is the Toshiba 32RL858's feature list for its £399 UK price, it can't help but make you wonder if Toshiba has had to compromise on the TV's performance somewhere along the way. Most cheap and cheerful 32-inch TVs are cut from more or less the same aesthetic cloth. They're almost universally fairly chunky bits of kit with wide bezels that are usually finished in some glossy but plasticky black colour. Toshiba appears to have recognised this lack of variety, and so has come up with something completely different with the 32RL858. For starters, it's a muted silver colour rather than black. Second, its bezel is exceptionally slim - not much wider, in fact, than the once-groundbreaking width of the bezels on the high-end Samsung 7000 Series TVs. Third, its rear is the absolute opposite of chunky, measuring only around 30mm deep. In short, the Toshiba 32RL858 is a perfect option for fitting either 'invisibly' into a main living room, or slipping into a potentially space-limited second room. Despite its slimness, though, the Toshiba 32RL858 has managed to cram a more than adequate number of connections onto its rear. These include three HDMIs, a USB port -through which you can play a solid mix of video (including DivX HD), photo and music file formats, a D-Sub PC port so the TV can double as a computer monitor and an Ethernet port - through which you can stream files from a networked PC or go online with Toshiba's Places system. If wiring your TV up to your router sounds like hassle, you can add Wi-Fi via a USB dongle. This dongle is an optional extra rather than being included free, but this is fair enough with such a cheap TV. The only bum note with the Toshiba 32RL858's connections is that most of them face straight out of the screen's rear, rather than permitting side access. This could clearly create a few problems for anyone wanting to wall-hang the set, and thus flies in the face of the ultra-slim bodywork. Casting an eagle eye down the Toshiba 32RL858's specification list, it's gratifying to discover that its screen is a Full HD one, despite its price, and that it has a Freeview HD tuner when it wouldn't have been surprising to find only a standard definition one. The TV set's slenderness is only possible, of course, because the screen is driven by Edge LED lighting. And, as usual, this has helped the Toshiba 32RL858 to deliver a startlingly high claimed contrast ratio - 3,000,000:1, to be precise. Or to be imprecise, given how large a pinch of salt such manufacturer figures need to be taken with. As if the use of Edge LED lighting wasn't surprising enough on a big-brand budget TV, Toshiba has also managed to include 100Hz processing on the set, which should hopefully mean it suffers less with motion blur than your average budget telly. And still this isn't the end of the surprises. For tucked away in the TV's on-screen menus is a suite of unexpectedly advanced picture adjustments. These include an adequate colour management system, complete with fine-tuning for the brightness and saturation of the six key colour components. Wrapping up the Toshiba 32RL858's remarkably long list of features is its Places online system. This remains one of the most attractively presented of all the smart TV interfaces, and is also to be admired for the unusual effort it puts into personalising the smart TV experience. You can set up different front ends for different users, with individual favourites lists and such like. It's no surprise to find that other brands are starting to deliver similar personalisation traits with their upcoming 2012 smart TVs. It's good to find, too, that Toshiba has recently added the Acetrax film streaming platform and Facebook to Toshiba Places - especially because prior to that, the platform's 'Social' Place was more or less empty. However, despite these new additions, the Places service remains rather behind the online services of its major rivals in raw content terms. Yes, there's BBC iPlayer and YouTube, plus a bunch of subscription-only services. But overall there isn't nearly as much going on in terms of free video streams or gaming/utility apps as there probably ought to be. Hopefully Toshiba will cram lots more content onto Places in the coming months. For the sake of completeness, it should probably be stressed here that the Toshiba 32RL858 doesn't carry any 3D support. But as well as 3D being of questionable value on a 32-inch TV unless it's going to be used predominantly as a gaming monitor, it's not really realistic to expect to find 3D on a budget TV. Even the occasional budget TV that has carried 3D has tended to make a mess of it.